Roger Federer maintained his fine record at this year's ATP World Tour Finals, but only just. Kei Nishikori fought the six-time former champion all the way in a pulsating Group Stan Smith clash, that saw Federer win 7-5, 4-6, 6-4 in two hours and 10 minutes. Federer, who had already qualified for the semi-finals, finishes round-robin play with a 3-0 record and now prepares for a semi-final against the runner-up of Group Ilie Nastase, Andy Murray or Stan Wawrinka. 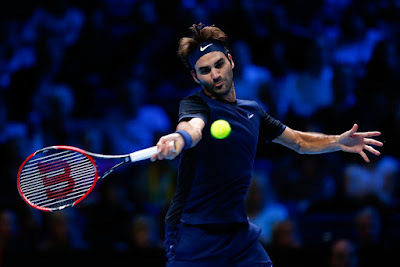 I enjoyed the match," said Federer. "It wasn't easy, but somehow I got it done. I look forward to playing him hopefully more often in the future." Third seed Federer broke eighth seed Nishikori for a 3-1 lead, but the Japanese star regrouped to win three straight games. Nishikori came within two points of taking a 5-3 lead, but Federer fought hard and lost just three of the next 12 points to take the 48-minute opener. Federer hit 12 winners. Federer looked set to triumph in straight sets, when he led 4-1, but Nishikori produced a spirited fight back to break serve in the seventh and ninth games. Nishikori calmly closed out to 15, when Federer mis-timed a forehand drop shot into the net. Two of their previous five meetings had gone to three sets. Federer dug himself out of a hole at 1-1, 0/40 in the decider, when Nishikori's forehand pierced his defence in lengthy baseline rallies. The mental battle appeared to be won, as Federer ran through the next two games for a 4-1 lead. But Nishikori was not a spent force, getting back to 4-4 to ensure a tense ending for the capacity crowd at The O2 in London. While Federer held to love for 5-4, a double fault and forehand error from Nishikori proved to be costly. Federer struck his 33rd and final winner, a smash, to wrap up the win. "It's amazing what Kei is able to produce on the court," said Federer. "Today, was another showcase of that, how he's able to return second serves, staying on top of the baseline, drilling forehands and backhands up the line. It was impressive." Federer has now gone 3-0 in group play on nine occasions and has reached the semi-finals on 13 of his 14 appearances. "I thought I was playing very good," said Nishikori. "I was making lot of returns. Second serve, I think I was attacking really well. I think that's why I able to break that much. But I didn't start each set well. I think every time he broke first and I was kind of defensive all the time. That was my big mistake today. I mean, in end really close game. I think just couple points that I didn't play quite well enough. But, yeah, it is a shame to lose like this. I thought I was playing well, so congrats to Roger." Federer has a 62-10 match record on the year, including six titles. Nishikori, appearing at the season finale for the second straight year, finishes 2015 with a 54-16 mark and three titles.